Abu Dhabi, UAE – Yas Waterworld Abu Dhabi is celebrating more than three million riders on four of its 45 thrilling rides, slides and attractions from the region and beyond, including famous faces the Tamilian superstar Rajinikanth, Macklemore and Dannii Minogue, as it completed two splashingly successful years of operations this weekend. The UAE’s first mega waterpark, which opened in January 2013, has experienced a blockbuster second year with visitor numbers continuing to increase. 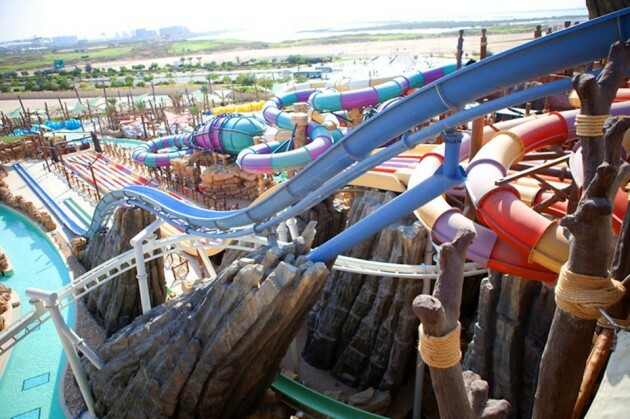 Registering over 3 million screams on tracked rides, including Dawwama, Liwa Loop, Bandit Bomber and Slithers Slides in 2014, guests flocked to the park to experience the waterparks world-first offerings. The second year also saw the waterpark scoop an array of industry awards, welcome VIP guests from across the world and host the globally-renowned World Flowboarding Championships, with Team UAE securing the international world title. Yas Waterworld’s second anniversary has marked the start of a year set to be jam-packed with fun-filled events, offers and announcements for all its thrill-seeking visitors. As the park looks ahead to 2015, guests can look forward to its unique Emirati theme coming to life to deliver legendary adventures, set to be announced later this year. New promotions will also kick-start the park’s third year of operations, with a new Family Annual Pass available for a limited time for families of four to enjoy the park’s extensive events in addition to its 45 rides, slides and attractions. “Throughout its second year of operations, the park has continued to exceed all of our expectations. 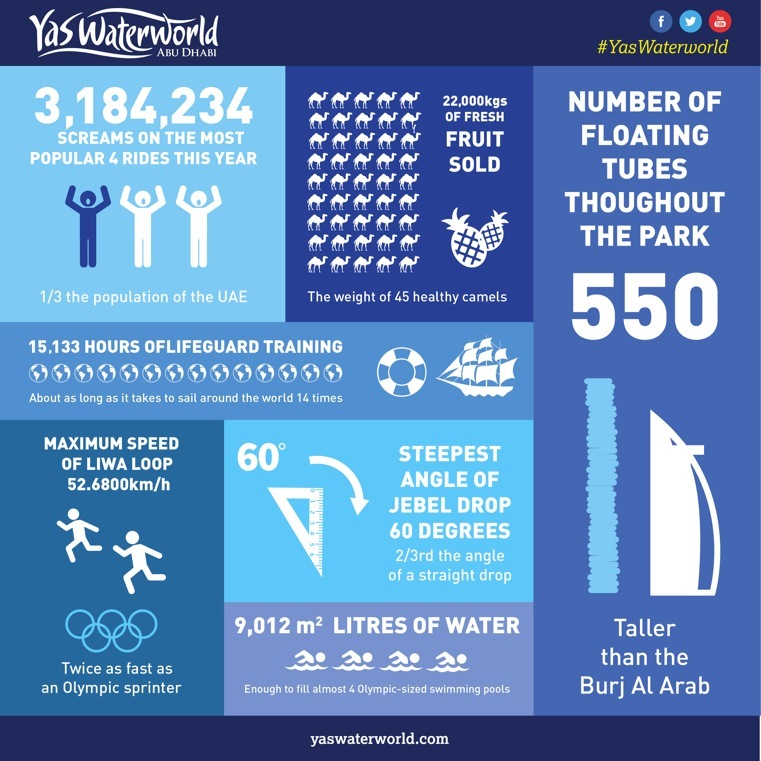 We have witnessed incredible visitor numbers, as well as an increasingly positive response from local, regional and international visitors,” said Tim Mow, General Manager at Yas Waterworld. “Still just two years old, the waterpark has already strongly grounded itself as a leading family-fun destination in the UAE, with a world-first offering and first-class level of service. We would like to say a huge thank you to all of our guests who have visited the park in the past two years to experience our world-first rides and attractions, and we look forward to welcoming familiar and new faces throughout Year Three as we announce some very exciting news very soon!” Mow added. 100 Family Days: Further cementing the waterpark’s reputation as the leading family destination in the UAE, Yas Waterworld offered families a jam-packed calendar of hugely successful celebrations, activities and offers from September – December 2014 as part of its 100 Family Days campaign. With events including the scrumptious Festival of Flavours, glimmering Festival of Lights and the internationally-renowned World Flowboarding Championships, the campaign is set to return later this year following an overwhelmingly positive response from guests from the UAE and beyond. The World Flowboarding Championships: 2014 saw Yas Waterworld host the World Flowboarding Championships for the second consecutive year on its very own Bubbles’ Barrel, the largest FlowBarrel Double sheet wave ride in the world. Welcoming 12 teams from across the world, Team UAE, led by Emirati flowboarder Mohammed Ibrahim Darwish and reigning world champion Clayton Barker, surfed through the competition to be crowned World Flowboarding champions 2014! Industry awards: Building on the array of awards secured in its first year, the waterpark reeled in more than six regional and international awards for its world-first offering and marketing initiatives during 2014, including the world’s largest travel site, TripAdvisor, presenting the park with two of its acclaimed accolades. Voted based on guest reviews and experiences, the website awarded the park with its 2014 Certificate of Excellence, as well as the Travelers’ Choice Award, reaffirming the park’s worldwide popularity as a family favourite destination. Waterpark to the stars: 2014 saw many famous faces walk through the park’s fortress-like doors, including the Tamilian superstar Rajinikanth who filmed the song of his latest movie ‘Lingaa’, as well as music idols Conor Maynard, Macklemore and Dannii Minogue. Other special guests included cricket legend Faf du Plessis, cricketing team the Rajasthan Royals and foodie fanatic Buddy Valastro from the popular reality TV series Cake Boss.